Global warming has been a trending topic in the last two decades. Many people have blamed it on the recent climate change. Global warming is defined as the gradual increase in the overall temperatures on the earth’s atmosphere (Peters, Andrew, & Boden, 2013). It is caused by increased release of carbon dioxide, chlorofluorocarbons and other pollutants in the air. Global warming has negatively affected the environment that once used to be beautiful and attractive. For example, the mountains that once used to be filled with snow are no more and generations to come may never enjoy the sites. The effect of global warming has been of concerns to the governmental organizations and non-governmental organization that deals with the conservation of the environment. The most commonly known organizations are Green Peace group, Idle No More and the Union of Concerned Scientists (Pandolfi, Connolly, Marshall, & Cohen, 2011). The Green Peace organization was formed in 1971 and its primary goal is to fight global warming. Idle No More has members mostly from Canada and was established in 2012. It is similar to the Union of Concerned Scientist. These organization have conducted campaigns to stop the emission of carbon dioxide in the air. They have also discouraged the establishment of industries that use coal-burning power plants. To solve the problem of global warming, these organization have suggested that carbon should be captured and stored for other uses (McCright & Dunlap, 2011). Carbon is freely available in the air. Carbon dioxide composition in the atmosphere is 0.03%. This amount of carbon must be maintained that way to ensure success in the ecosystem (Fornara & Steinbeiss, 2011). For example, human beings breathe in oxygen and breathe out Carbon dioxide. The plants during the process of photosynthesis take in carbon dioxide and give out oxygen. Therefore, the balance is essential for both human and animals. The excess gases can to be tapped and stored in a process called carbon sequestration. The process involves storing of the carbon to be used for other purposes. Carbon dioxide can be used in the fire extinguishers and the manufacture of soft drinks among other uses (Clemmensen, Bahr, & Ovaskainen, 2013). Terrestrial sequestration (Mitsch, Bernal, Nahlik, & Mander, 2013). The whole process takes place through the process of photosynthesis. As plants absorbs and transforms several components that are essential for their growth, they absorb carbon dioxide from the air. The carbon dioxide is later processed and stored in the roots and stems of the plants. 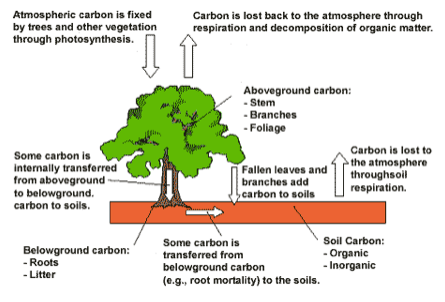 The excess carbon is later stored in the soil. The amount of carbon in the stems and roots of a plant is twice that in the air. The soil also accumulates up to 2.5 times carbon present in the living things. The cycle of carbon continues and after the plant dies it decomposes and carbon combines with oxygen as it joins the components of air. It goes back to the air as carbon dioxide to be used by other plants (Fornara & Steinbeiss, 2011). Trees breathe more carbon dioxide from the atmosphere than smaller plants. Trees take a long time before realising carbon back to the air. This makes trees to be the most preferred tools to fight against global warming (Song, Wang, Strong, Li, & Jiang, 2012). Different plants in different places have a different rates of carbon dioxide sequestration. The following table shows the range of carbon dioxide sequestration rate according to various places the grow. Rate of CO2 sequestration (Mitsch et al., 2013). It is evident that wet areas have a greater carbon dioxide sequestration rate. It is because their growth rate in those areas is high and will need more carbon dioxide (CO2) to grow than in other places (Mitsch et al., 2013). Pre-combustion captures fuel into a gaseous mixture of hydrogen and carbon dioxide. Hydrogen is then separated from CO2. and is then compressed for transport and storage. Post-combustion involves combusting exhaust gases to separate CO2. The gas is then captured using a liquid solvent method. After it has been absorbed in a solvent, it is heated to obtain a high purity CO2 stream. It is mostly used in the food and beverage industry. The oxyfuel combustion process uses oxygen for the combustion of fuel. This process produces water vapour due to the combination of hydrogen and oxygen. Carbon is then compressed, transported and placed into injected wells (Song et al., 2012). Carbon is stored in rocks that are miles below. The storage wells consists of porous rocks that are responsible of holding the CO2. On top of them, there is a formation of rocks that are impermeable. It is made up of non-porous layer that prevents CO2 from rising upwards. 25% of the carbon released to the air comes from different industrial processes (Dammel & Bielicki, 2011). This carbon cannot be adequately captured through terrestrial sequestration since plants cannot take more carbon dioxide that it requires. It is, therefore essential for various industries especially those using Fossil fuel, to have geologic sequestration to store Co2. In October 2014, Boundary Dam power station in Saskatchewan, Canada, was among the first projects that implemented geological sequestration (Trenberth & Dai, 2014). It was a great initiative for Canada and the rest of the world should follow to preserve the environment and fight against global warming. The world have recently shown a lot of concern in the prevention measures of global warming. This has been through the many campaigns that they have taken into the streets and the also the planting of trees. In 2011, more than 62 million trees were planted across the world. In the late July 2015, President Obama of United States introduced a rule that stated all the power plant carbon emission should reduce their carbon dioxide emission up to 32% by 2030. This was a great move bearing in mind that most of the power used in United States comes from these power plants. This is a great example of states that will have to adopt geologic sequestration to achieve the set goal. Clemmensen, K., Bahr, A., & Ovaskainen, O. (2013). Roots and associated fungi drive long-term carbon sequestration in boreal forest. Science. Retrieved from http://www.sciencemag.org/content/339/6127/1615.short. Dammel, J., & Bielicki, J. (2011). A tale of two technologies: hydraulic fracturing and geologic carbon sequestration. Environmental Science & …. Retrieved from http://pubs.acs.org/doi/pdf/10.1021/es201403c. Fornara, D., & Steinbeiss, S. (2011). Increases in soil organic carbon sequestration can reduce the global warming potential of long‐term liming to permanent grassland. Global Change …. Retrieved from http://onlinelibrary.wiley.com/doi/10.1111/j.1365-2486.2010.02328.x/pdf. Jung, H., Jansik, D., & Um, W. (2012). Imaging wellbore cement degradation by carbon dioxide under geologic sequestration conditions using X-ray computed microtomography. Environmental Science & Technology. Retrieved from http://pubs.acs.org/doi/abs/10.1021/es3012707. McCright, A., & Dunlap, R. (2011). The politicization of climate change and polarization in the American public’s views of global warming, 2001–2010. The Sociological Quarterly. Retrieved from http://onlinelibrary.wiley.com/doi/10.1111/j.1533-8525.2011.01198.x/full. Mitsch, W., Bernal, B., Nahlik, A., & Mander, Ü. (2013). Wetlands, carbon, and climate change. Landscape …. Retrieved from http://link.springer.com/article/10.1007/s10980-012-9758-8. Pandolfi, J., Connolly, S., Marshall, D., & Cohen, A. (2011). Projecting coral reef futures under global warming and ocean acidification. Science. Retrieved from http://www.sciencemag.org/content/333/6041/418.short. Peters, G., Andrew, R., & Boden, T. (2013). The challenge to keep global warming below 2 C. Nature Climate …. Retrieved from http://www.nature.com/nclimate/journal/v3/n1/full/nclimate1783.html. Song, Z., Wang, H., Strong, P., Li, Z., & Jiang, P. (2012). Plant impact on the coupled terrestrial biogeochemical cycles of silicon and carbon: Implications for biogeochemical carbon sequestration. Earth-Science Reviews. Retrieved from http://www.sciencedirect.com/science/article/pii/S0012825212001250. Trenberth, K., & Dai, A. (2014). Global warming and changes in drought. Nature Climate …. Retrieved from http://www.nature.com/nclimate/journal/v4/n1/full/nclimate2067.html. Brandie loves to express her ideas in writing. She frequently reads articles and contributes to Project Guru’s knowledge tank. She strives to produce high quality work so that she can effectively communicate to her readers. When she is not working, she loves to swim. She has an open mind and is always ready to build on new ideas. She holds a degree in Bachelor of Arts and has worked as a teacher for five years. Writing, has been her passion and she uses it as a tool to communicate, unite and transform the world. India’s commitment towards environmental protection and climate change There is a rising consensus for environmental protection across the world. Climate change is a concerning issue all over the world due to its manifold detrimental aftereffects. Organic waste management across the world Organic waste, often referred to as ‘green’ waste actually is that type of waste which originates from unprocessed and untreated materials such as food products, garden materials and lawn trimmings (Chernicharo, 2003).